Two days ago, I planned this kindergarten lesson with Nicole and we taught it today! It was so much fun and I just have to say, I have such an admiration for Kindergarten teachers..that hour was tiring! The Number Talk was a sequence of two dot images, both showing 7. It always amazes me to see the students counting, explaining their counting and writing equations so beautifully this early. In both images we heard counting by ones, counting by “2’s and 1 more,” and saw students count by ones and twos in different orders, solidifying the concept that the order in which we count does not change the total dots in the image. There was such a wonderful culture in place where students were open to agree, disagree, share answers (right or wrong) and all of this was shown to be valued by Nicole. 1 – Every group except one placed it on the far left. It was interesting to me that each group put the card under the blue tape, not on it. 0 – They all shifted the 1 card to the right and replaced it with the 0. I saw one group have a group member place it at to the very left of the blue tape, just before the blue tape actually started and a group member said, “That would be a number if you put it there, but zero is a number” as he moved it under the very beginning of the tape. So cool. 3 – This is where some serious shifting happened. I didn’t get to see all groups do their moving, but as I walked around, I did see the 3 very close to the 1 and all of the tens that were at the end of the line, moved down. It seems their spacing strategy had taken over. 9 – All of them attached it to the left side of 10. Before we gave them 5, where we really wanted to see how they dealt with the half, Jen, Nicole and I convened quickly to figure out how we were going to see that. We thought the ten at the end would be much easier to see their thinking about 1/2 so we decided to tell the students that 10 was going to be their biggest number to see if that changed their line. We got a couple, “Ohs” and slides of the 10 and 9 to the very right end. 5 – Most went back to counting spots but I did catch a couple groups looking at spacing. One group was using the 1 card to decide on the spot for a 5 while another group said they knew 5 and 5 was ten but was having a hard time using that to place the card. The above group worked from the right. Loved the extra space before the 0 here! This was by far the most popular line! Then we had students walk around to other lines and talk about similarities and differences to their line. It was great to see the group who started on the right notice that the other groups started on, “that end” while the spacing was a huge topic of conversation. One little girl, whose group had placed all of the cards touching, said she knew why they spaced them out….”They took a breath. Like one, take a breath, two, take a breath, three, take a breath…” I had never thought about how the visual could impact the way we think about timing in our counting! The closer they are the quicker we count, the more spread out, the slower we count. Loved it! We regrouped on the carpet and talked briefly about what they noticed…. All of the groups went started at 0 and went to 10. Some were spread out far. Some had the cards squished together. Then, because we are just so curious to hear about connections they make, Nicole asked if they saw anything the same about the ten frames they have been using in class and the number line. A few students said both had ten and one little girl said it was like 5 and 5. Then, it was pretty awesome…she went up to show it was 5 and 5 and started counting at the zero card, so zero was 1, the one card was 2 and so on so needless to say when she ended her second 5 she was at 9. She said, huh? Loved it! Another student raised her hand and said it was because she counted too many, she started at zero and there is no zero on a ten frame. it was SOOO much fun and I feel so lucky to get to see and hear all of this amazing math conversations across these K-5 classrooms. 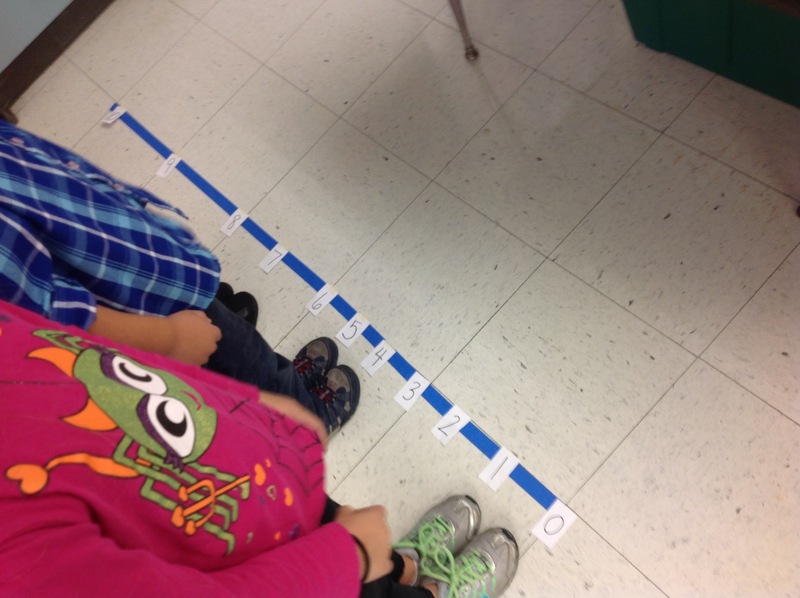 I wonder if students could think about when the number line would make sense to have all of the cards closer together. Like if a lesson was adding to 20 and 20 was on the end now, what would happen? Could we think about measuring things that are really short versus things that are really long? That feels like choosing the appropriate unit of measure to me. Could we just leave it up and see if students reference it? and maybe refine the distance between each number? Could we find some children’s lit that are around measurement and reference the line? Could we put some painters tape in the hallway and see how they interact with it? Could they think about walking every tile line versus the feel of two tiles each time? Could they model addition on there? Like in connection to maybe their dot image number talks? So much to think about and I don’t know if any of these ideas are right or wrong or even age appropriate, but I am loving learning this stuff!! I am just so thankful to have such unbelievable colleagues who love to play around with these ideas with me! This entry was posted in Kindergarten, Number line and tagged Kindergarten, Number line on October 29, 2015 by mathmindsblog. My suggestion is to go into length, by visual comparison (longer/shorter), ordering by length, and then by side by side comparison, leading to “this one is twice as long as that one” and so on. then develop a stick line and see if numbers can be attached in a meaningful way. They may see that a) they get a number line, b) the numbers are evenly spaced, and c) it means something. You’ll need a lot of sticks ! Love this lesson. I wonder if you did a number like the Headbanz game and they had to put each other in order without telling the number and then guess what number they had. 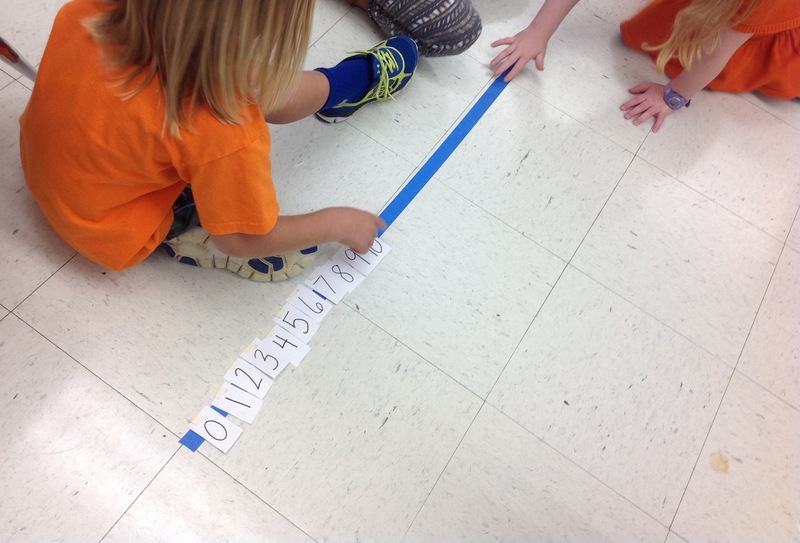 I love imagining these children exploring how to create a number line. Bravo! I am thinking that the activities that help them continue thinking about spacing would be great. What if they tried to make a number line on the same size string from 0 to 20 (as in your first bulleted idea), then from 0 to perhaps 7and discuss the differences between them. They could place pictures at different points on a number line on the floor and walk different distances to help them think about intervals with questions like, “How far do you need to walk to get from 0 to the house at 7? Or how about to the house at 4?” Are they seeing that they need equal intervals between numbers? I think modeling some of the addition in the dot image number talks by walking on a floor number line would be another great way to model addition at this point.